Did you know… Australians spend on average about 10 hours and 24 minutes every day engaging with their mobile devices (1). It is not surprising that within five minutes of waking up 35% of us check our phones, and 70% use our phones during mealtimes with family and friends (2). The excessive reliance on these digital devices is taking a toll on our bodies. Looking down hunched over mobile devices puts excessive strain on the neck which can cause neck pain. This is now commonly referred to as ‘Text Neck’. In addition to headaches, neck and back pain, text neck and poor posture have also been linked to digestive problems, a reduction in lung capacity by up to 30 percent, and the increased risk of heart disease and neurological issues (3). 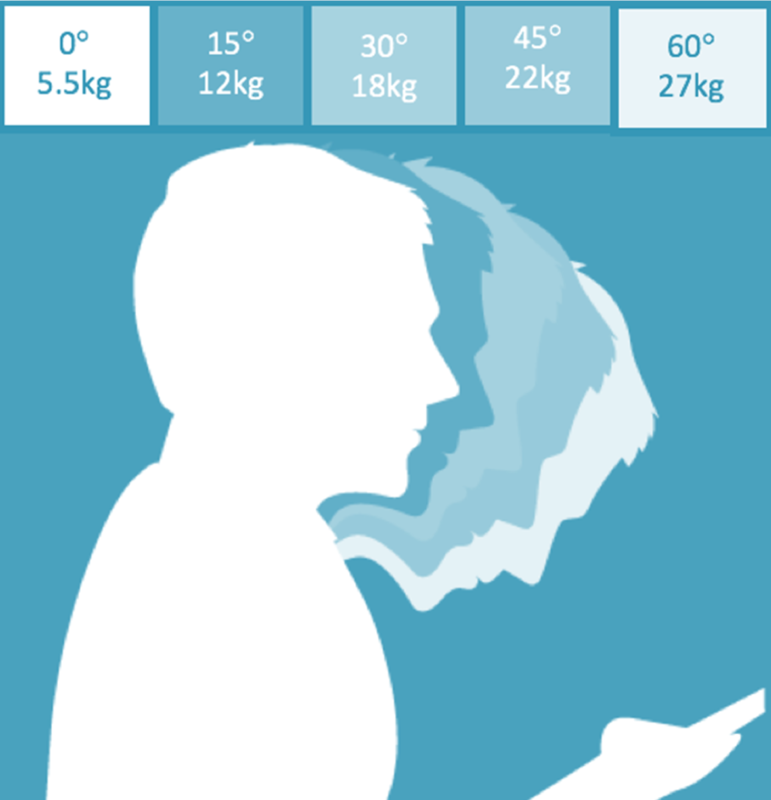 The average person’s head weighs around 5kg in normal posture, but can increase to a staggering 27 kg, five times the normal weight of the head, depending on how far forward the head is bent forward (4). Limit games and/or social media: Make an active effort to use your phone more productively. Take frequent breaks: A “text neck” is an accumulated injury over time – prevention begins by taking breaks from your mobile device every 15 minutes, stretching the neck by looking up and bringing the neck back into the neutral position. Alternatively, hold your mobile device higher so that it’s aligned with your eyes, rather than at your chest and your neck muscles do not fatigue. Use an ergonomically efficient computer or laptop for more regular browsing. A more practical recommendation would be frequent rest breaks or some physical exercise that can strengthen the neck and shoulder muscles. Get checked by your Chiropractor or health care professional to address any current underlying (even possibly unknown) spinal issues and postural deformities. 3. Hansraj. KK (2014) Assessment of stresses in the cervical spine caused by posture and position of the headSee comment in PubMed Commons belowSurgical Technology Int. Nov; 25:277-9.